Let someone know they are beautiful with a gift of this designer mug by master ceramicist Keith Brymer Jones. The word “beautiful” has been expertly hand-embossed & hand-painted, creating a unique & unusual piece of designer tableware. 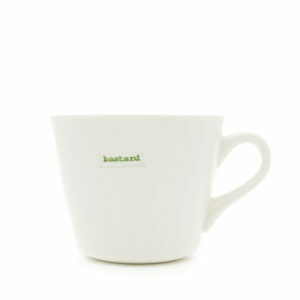 Crafted from super white porcelain to create a designer mug that is microwave & dishwasher safe, for practicality & style. Let someone know they are beautiful with a Keith Brymer Jones beautiful mug. 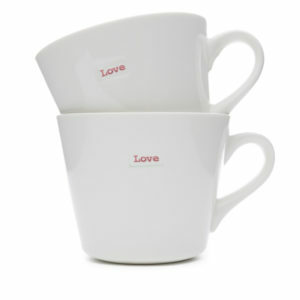 The beautiful mug is part of the Keith Brymer Jones’ Word Range of designer tableware. Every piece of designer tableware in the Word Range is hand-finished with a word or phrase gently pressed into the wet porcelain and hand coloured. The unique shape of Keith’s Bucket Mugs was inspired by a vintage water bucket in his Whitsable pottery studio. This designer mug is crafted from super white porcelain to be dishwasher safe & microwave safe.